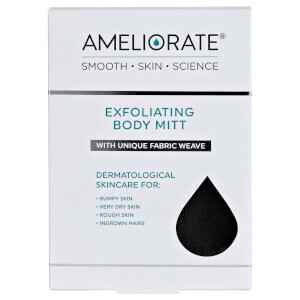 Transform your skin with the Three Steps to Smooth Skin gift set from AMELIORATE, a brand that specialises in treatment for Keratosis Pilaris, or dry, bumpy ‘chicken skin’. The exfoliator, body wash and lotion work in harmony to slough away dead cells, replenish lasting hydration and banish ingrown hairs for a soft, smooth and silky skin texture. The rich and emollient moisturiser uses the exfoliating powers of Lactic Acid to sweep away dead cells, resurfacing the skin and promoting renewal and repair. At the same time, a potent blend of Alpha Hydroxy Therapy and Sweet Almond Oil works to lock in hydration for up to 12 hours, strengthening the natural moisture barrier and improving elasticity. The body cream provides instant comfort whilst also improving the skin texture and condition over time for smooth, soft and healthy results. Body Exfoliant: Use 2-3 times weekly. Massage into DRY skin before showering or bathing. Leave on the skin for a few minutes to ensure the product works to its optimum before rinsing off. Follow with Body Lotion. Body Wash: Squeeze into hand and lather over wet skin, rinsing well after use. Follow with Body Lotion. Body Lotion: Apply twice daily for 4 weeks for Keratosis Pilaris and very dry skin. Thereafter apply daily to maintain skin's condition. Apply daily for normal skin. Body Exfoliant: Aqua/Water/Eau, Synthetic Wax, Glycerin, Bambusa Arundinacea (Bamboo) Stem Extract, Lactic Acid, C12-15 Alkyl Benzoate, Cetearyl Alcohol, Petrolatum, Polysorbate 60, Isopropyl Palmitate, Butyrospermum Parkii (Shea) Butter, PEG-100 Stearate, Glyceryl Stearate, Dimethicone, Phenoxyethanol, Ammonia, Sodium Carbomer, Sodium Benzoate, Cocos Nucifera (Coconut) Oil, Theobroma Cacao (Cocoa) Seed Butter, Potassium Sorbate, Fragrance (Parfum), Xanthan Gum, Hydrolyzed Milk Protein, Disodium EDTA, Pentylene Glycol, Serine, Sodium Lactate, Sorbitol, Urea, Linalool, Citronellol, Citrus Aurantium Dulcis (Orange) Oil, Juniperus Mexicana (Cedarwood) Oil, Sodium Chloride, Pelargonium Graveolens (Geranium) Oil, Allantoin. Body Lotion: Aqua/Water/Eau, Lactic Acid, C12-15 Alkyl Benzoate, Glycerin, Prunus Amygdalus Dulcis (Sweet Almond) Oil, Ammonia, Ethylhexyl Palmitate, Cetearyl Alcohol, Glyceryl Stearate, PEG-100 Stearate, Dimethicone, Hydroxyethylcellulose, Phenoxyethanol, Cetearyl Glucoside, Xanthan Gum, Sodium Benzoate, Sodium Stearoyl Glutamate, Tocopheryl Acetate (Vitamin E), Fragrance (Parfum), Potassium Sorbate, Pentylene Glycol, Hydrolyzed Milk Protein, Disodium EDTA, Serine, Sodium Lactate, Sorbitol, Urea, Linalool, Citronellol, Sodium Chloride, Citrus Aurantium Dulcis (Orange) Oil, Limonene, Coumarin, Juniperus Mexicana (Cedarwood) Oil, Alpha-Isomethyl Ionone, Allantoin, Pelargonium Graveolens (Geranium) Oil, Geraniol. I used these product on 2 week trip and did not notice any difference in my skin condition. Shower gel had nice texture but I did not see results from scrub and lotion.